In The Court and the World: American Law and the New Global Realities, Justice Breyer examines the work of SCOTUS in an increasingly interconnected world, a world in which all sorts of public and private activity—from the conduct of national security policy to the conduct of international trade—obliges the Court to consider circumstances beyond America’s borders. At a time when citizens may book international lodging through online sites like Airbnb, it has become clear that judicial awareness can no longer stop at the water’s edge. 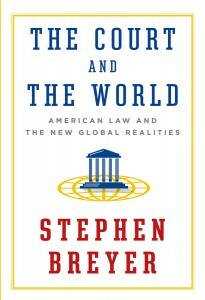 To trace how foreign considerations have come to inform the thinking of the Court, Justice Breyer begins with national security in its Constitutional dimension—how should the Court balance this imperative with others, chiefly the protection of basic liberties, in its review of presidential and congressional actions? He goes on to show how the Court has also been obliged to determine the application of American law in international contexts in a great many more everyday matters, from copyright to the interpretation of international treaty obligations. While Americans must determine their own laws through democratic process, the smooth operation of American law depends on its working in harmony with that of other jurisdictions. Justice Breyer describes how the aim of cultivating such harmony, as well as the expansion of the rule of law overall, has drawn American jurists into the relatively new role of “constitutional diplomats,” a little remarked but increasingly important job for them in our ever changing world. In conversation with Nina Totenberg, NPR’s award-winning legal affairs correspondent. Book signing to follow.